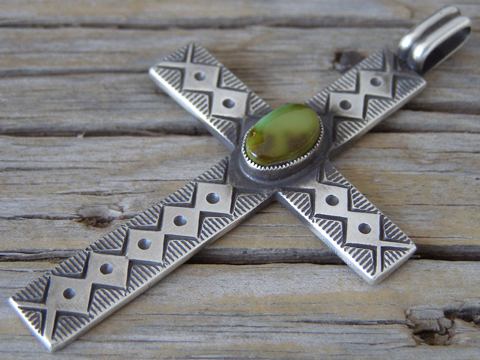 This ingot Sterling cross pendant is decorated by Calvin's handmade, unique stamps and set with an oval of natural, untreated Royston turquoise from Nevada. He melted his silver, poured it out and hammered it to a somewhat uniform thickness before putting it through a hand rolling mill to make the thickness of the silver perfectly uniform. Working the silver this way makes it denser and is a labor-intensive, old-fashioned way to smith silver. This is how silver was originally worked by Navajo smiths, but very few smiths work the silver this way today. Hallmarked C.MTZ inside an arrowhead and stamped Sterling and Navajo on back. Dimensions (excluding bale): 2 3/8" x 1 5/8"